Floating Pennywort is treated using weed cutting boats and herbicide. A killer weed which can choke waterways of oxygen and cause flooding has been spotted in Berkshire. Floating Pennywort, which originated in North America, has been found in Foundry Brook, in Reading, which runs into the River Kennet. The Environment Agency said it was tackling the water-weed which can grow up to 20cm (8in) per day. If left untreated it can swamp rivers and deplete oxygen levels, threatening animals and plants. It can be treated by using weed cutting boats with special lifting mechanisms as well as harvesters and herbicide. Daryl Buck, from the Environment Agency, told BBC Radio Berkshire: "It's very rapidly growing and it can smother out native wildlife and can take up quite a bit of space in the water channel. "In the wrong places it can pose a flood risk." 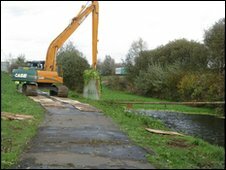 The Environment Agency in Berkshire has so far spent about £20,000 in 2009 clearing up the weed.